Neurology - forum with Physicians ! 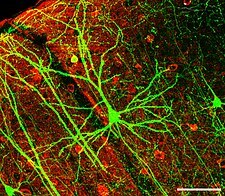 A network of dendrites from neurons in thehippocampus. Neurology (from Greek: νεῦρον, neuron, and the suffix -λογία -logia "study of") is a branch of medicine dealing with disorders of the nervous system. Neurology deals with the diagnosis and treatment of all categories of conditions and disease involving the central and peripheral nervous system(and its subdivisions, the autonomic nervous system and the somatic nervous system); including their coverings, blood vessels, and all effector tissue, such as muscle. Neurological practice relies heavily on the field of neuroscience, which is the scientific study of the nervous system. A neurologist is a physician specializing in neurology and trained to investigate, or diagnose and treat neurological disorders. Neurologists may also be involved in clinical research, clinical trials, and basic ortranslational research. While neurology is a non-surgical specialty, its corresponding surgical specialty is neurosurgery.